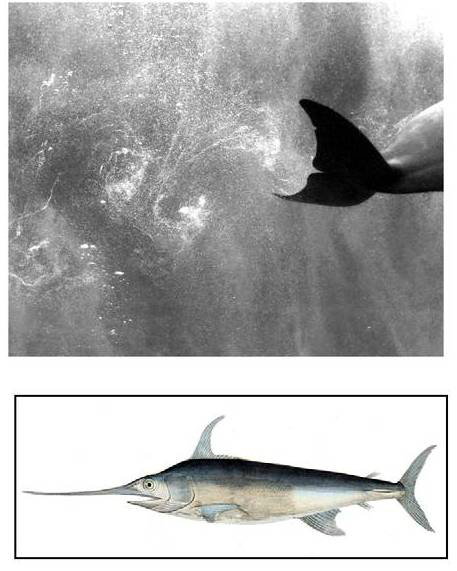 What makes dolphins and swordfish such fast swimmers? A factor that was overseen by Gray in 1937 was that muscle power of the dolphin is largely used to undulate its body, more specific to produce powerful up and down sweeps of its tail ( ‘flukes’) causing hydrodynamic vertical forces and ‘drag’ turbulence behind the tail. So the great propulsive forces of the dolphin seemed to resulted mainly from movements of its tail. But up to recently there were no ways to measure directly the force exerted by a dolphin and the forward thrust of its body. The method Wei a.o. used method came from aerospace and is known as Digital Particle Image Velocimetry (DPIV). DPIV measures were based on a analysis of video recordings of micro air bubbles injected in a pool with swimming bottlenose dolphins (Tursiops truncatis). DPIV can capture up to 1,000 video frames per second. They found that the dolphin exerted approximately 200 lb of force every time it thrusts its tail – much more than Gray hypothesized – with at peak force between 300 to 400 lb. Without going into all the technical details: ‘dorsoventral oscillations of the flukes of the dolphin produced pairs of counter-rotating vortices during each propulsive cycle. One vortex was generated for each upstroke and each downstroke of the tail’( (see picture, upper panel). ***Videler, J. J., Haydar, D.,Snoek,R.Hoving, H.-J. T. and Szabo, B. G. (2016). Lubricating the swordfish head. J. Exp. Biol. 219, 1953-1956.